London, U.K., May 3, 2017 - Flight Experience London (FEL) is offering a unique and memorable present for Dads this Father’s Day - the gift of flight. Don’t give a pair of socks or a new power tool this year - instead treat your Dad to an experience he truly won’t forget. As soon as he steps through the cockpit door and takes his seat at the flight deck, your Dad will become Captain of a Boeing 737 aircraft simulator. After carrying out real pre-flight aircraft checks and talking to Air Traffic Control, a fully qualified instructor will take him through the controls of the aircraft and then allow him to fully experience the exciting sensations of take-off, climbing, cruising and landing. FEL is the UK’s only Flight Simulator business of its kind to be classified as an ‘Official Boeing Licensed Product’. The cockpit is built from a former aircraft so the controls are identical to those you would expect to find inside a real plane - every lever and button is operational and will have an effect on the flight if used. Featuring high-definition 180 degree screens with panoramic visuals - and immersive sound and vibration sensations - you can experience flight like never before. For most people, stepping into a cockpit and flying a commercial aircraft is only a dream but FEL is hoping to change that and provide an exciting, challenging and most importantly, fun experience that will change the way you fly as a passenger forever. With options ranging from scenic flights around a city of your choice through to a 90 minute real-time city-to-city flight, the software at FEL allows you to fly from over 24,000 different airports, located across the globe. FEL is offering special Father’s Day Flight packages at the helm of a Boeing 737-800 aircraft, including “Fly & Dine” options, starting from just £109. Journalists are welcome to visit to review the simulator. Flight Experience is the world’s number one flight simulator entertainment business with 13 simulators in nine countries. 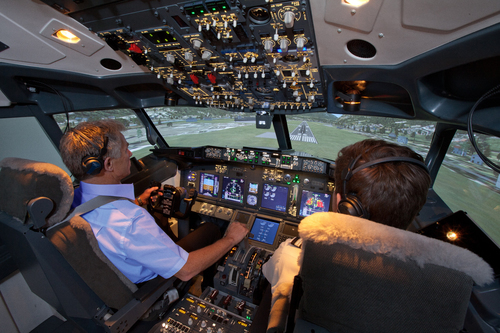 The simulator is based on the Boeing 737NG. It is designed specifically as an entry level training device with capability for use as a public experience simulator. It provides a superb environment that replicates a modern twin jet environment. The Boeing 737 Series is the biggest selling jet airliner ever built. The aircraft size, configuration, economy, range and reliability have made the series a favourite with airlines around the world. Since the 737 was launched in the 1960s with the 737-100, more than 12,700 orders have been placed.